Tactical Soccer (www.tacticalsoccer.us) is pleased to announce that our software has been selected by Rush Soccer (www.rushsoccer.com) to aid coaches on the Rush Select program. Rush Soccer Select program forms select teams (All-Star teams) that are comprised of the top Rush players from across the country at the U13-U17 age groups. These teams attend various events, both domestic and international, on a yearly basis. Player pools are established through club recommendations and identification at the Rush Festival and the Select ID Camps. Players can move in and out of the player pool based on their current form. Select Team coaches have the final say in which players make the roster for any particular event. Beside being one great tool to create and animate exercises, Tactical Soccer allows coaches to evaluate players across six metrics / skill levels — currently tactical, technical, conditioning, speed, psychological & physical. 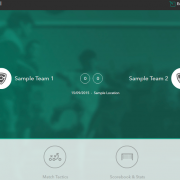 Player reports can be assessed in Tactical Soccer or shared via an emailed PDF report.